Accessed in the Contents pane by clicking the coordinate system picker button for the component. The source format specified the wrong initial coordinate system. The user manually specified the wrong initial coordinate system using the Assign Initial Coordinate System dialog. Sometimes there is an error in the source data. For example, if a GIS operator wrongly specifies that a drawing uses Lambert Conformal Conic projection when it uses a Transverse Mercator projection, and then saves the drawing in a format that conveys coordinate system data, the file will wrongly state to every GIS that imports that drawing that it uses Transverse Mercator. When imported into Manifold, the data will earnestly tell Manifold, with the full force and power and precision of the format, that it uses Lambert Conformal Conic and Manifold will believe it. The drawing ends up imported into Manifold marked as having Lambert Conformal Conic as the assigned initial coordinate system. Until we try to use that drawing as a layer together with other drawings or images which are not in error, we might not notice the mistake. When we do notice the mistake we can use the Repair Initial Coordinate System dialog to change the assigned initial coordinate system to the correct Transverse Mercator coordinate system. A more frequent use of the Repair Initial Coordinate System command is to repair errors made with the Assign Initial Coordinate System dialog. Sometimes we must import data that we know is projected but which is stored in a format that does not specify projection (coordinate system) information. In such cases we might use the Assign Initial Coordinate System dialog to try a best guess, for example Latitude / Longitude. If that does not result in the imported drawing correctly lining up with other, "known good" layers, we might want to try some other guesses. For those we can use the Repair Initial Coordinate System command. A related case is when we use Assign Initial Coordinate System to assign the initial coordinate system and we get most, but not all, of the coordinate system right. For example, we might try a default favorite coordinate system, Latitude / Longitude, and see that everything seems to line up OK. The default Latitude / Longitude coordinate system built into Manifold's Favorites list uses WGS84 as the datum, but there is a vast amount of spatial data in the world that uses other datums, such as NAD27. The difference between the two datums is not that much, but it can be significant, as discussed in the Latitude and Longitude are Not Enough essay. If we later discover that our imported drawing was indeed in Latitude / Longitude, but in a form that used the NAD27 datum, we can use the Repair Initial Coordinate System command to adjust the assigned initial coordinate system to use the NAD27 datum. 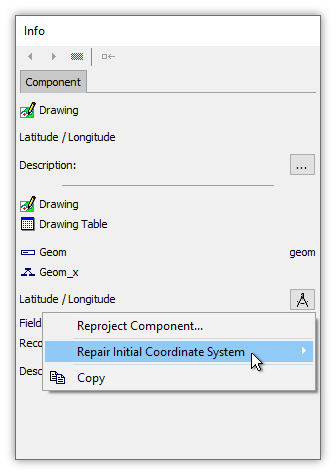 Using the Repair Initial Coordinate System dialog is similar to using the Assign Initial Coordinate System command. For a step-by-step illustrated example using the Assign Initial Coordinate System command, see the Example: Assign Initial Coordinate System topic.